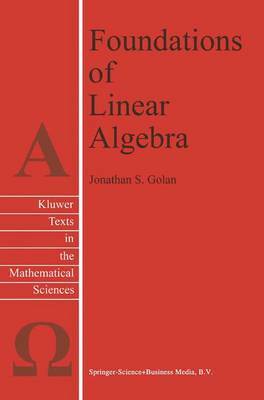 This book is an extensively revised version of my textbook "Yesodot HaAlgebra HaLiniarit" (The Foundations of Linear Algebra) used at many universities in Israel. It is designed for a comprehensive one-year course in linear algebra (112 lecture hours) for mathematics majors. Therefore, I assume that the student already has a certain amount of mathematical background - including set theory, mathematical induction, basic analytic geometry, and elementary calculus - as wellas a modicum of mathematical sophistication. My intention is to provide not only a solid basis in the abstract theory of linear algebra, but also to provide examples of the application of this theory to other branches ofmathematics and computer science. Thus, for example, the introduction of finite fields is dictated by the needs of students studying algebraic coding theory as an immediate followup to their linear algebra studies. Many of the students studying linear algebra either are familiar with the care and feeding of computers before they begin their studies or are simultaneously en- rolled in an introductory computer science course. Therefore, consideration of the more computational aspects of linear algebra - such as the solution of systems of linear equations and the calculation of eigenvalues - is delayed until all students are assumed able to write computer programs for this purpose. Beginning with Chap- ter VII, there is an implicit assumption that the student has access to a personal computer and knows how to use it.